You’ve decided to create an eCommerce site, and chose OpenCart as your platform. After all, it’s open source, easy to set up, widely respected, and growing like wildfire. Now it’s time to make your store your own. 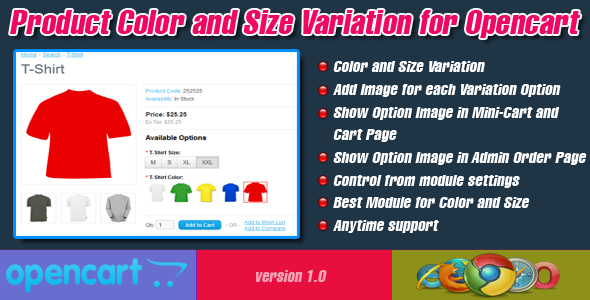 CodeCanyon’s OpenCart Extensions and Modules will give you all the customization you need! These are the best-selling extensions of 2014. Flexible and fast checkout for customers. This extension is easy to integrate, so you give your customers less steps are required to buy a product, and a nicer interface to boot. 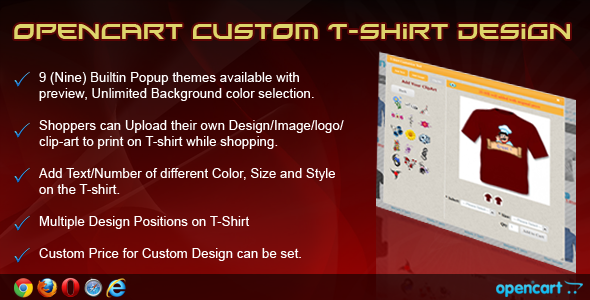 An OpenCart module used to design t-shirts. The front and back can include your logo, an image, clip-art or text. Customers can upload multiple images, and just drag the image on different positions, or select existing clip art from the sample items which you’ve uploaded for them. The biggest problem OpenCart sites face is the duplicate penalties caused by its default link scheme. This extension solves that problem by standardizing one proper link for each page, and 301 redirecting all of the “ghost” versions to the proper link. Boost your SEO efforts in just minutes. Add images to products and colour options to category, and list items by featured, best seller, specials, and latest listing. This module provides the easiest way to filter results by the included options in OpenCart. It adds layered navigation by category and options. 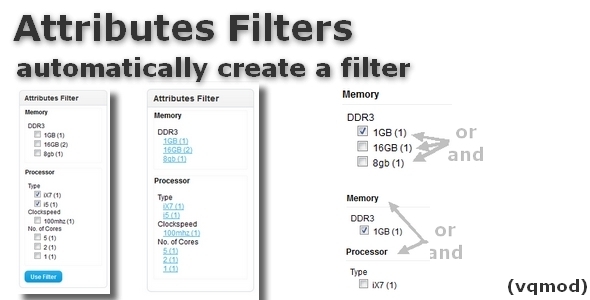 The module automatically create a filter by product in that category. This module provides an easy way to filter results by the included Attributes in OpenCart. It adds layered navigation by category and Attributes. 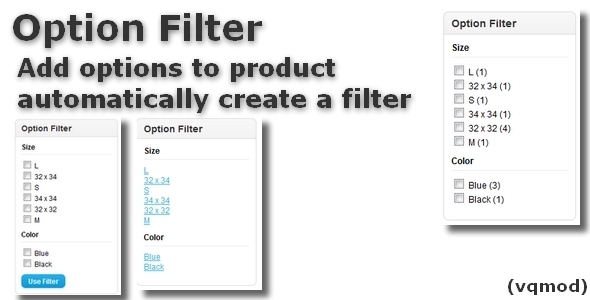 The module automatically create a filter by product in that category. This module has options like Add Image for each Variation Option, Show Option Image in Mini-Cart and Cart Page, Show Option Image in Admin Order Page, Control from module settings. OpenCart has a very serious weak point in terms of SEO that allows you to access the single URL in different ways, for example directly or through the category. This plugin not only provides canonical URL fix, it also removes URL duplicates on the core level. 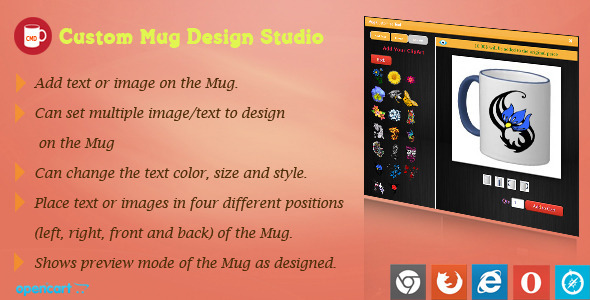 An OpenCart module used to design mugs. The front and back can include your logo, an image, clip-art or text. Customers can upload multiple images, and just drag the image on different positions, or select existing clip art from the sample items which you’ve uploaded for them.